It’s probably fair to suggest that no-one really thought that Apple’s AirPods would come in for the praise and rave reviews that they’ve been getting ever since they became available to the general public after a frustrating launch delay. Many consumers who originally thought that AirPods would be gimmicky and unusable in a practical sense have since been proven entirely wrong, and have instead gone on to lavish praise onto Apple’s latest product, with CEO Tim Cook already terming AirPods as a “runaway success“. However, for those who are still looking to get their hands on the AirPods, but are having no luck with stock on a local level, and with online orders now pushed back to late February delivery, what are the options? 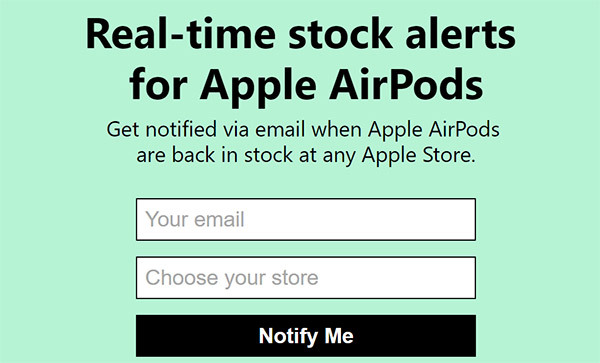 Fortunately for them, a recently launched web service looks to try and solve this problem with instant real-time stock notifications for AirPods availability at a chosen Apple Store. The website bills itself as being a service that offers “Real-time stock Alerts for Apple AirPods.” And that’s what it mostly does apart from displaying all Apple stores worldwide in one single page showing which ones have AirPods in stock and which ones doesn’t. A simple text-field entry interface at the top of main page asks for a valid email address as well as a chosen Apple Store. When provided, the service will then issue an email to the provided email address as soon as stock of AirPods arrives into the selected Apple Store. The user is then able to rush directly to that Apple Store to try and get their hands on the newly stocked AirPods, or take a chance and try and book one for an in-store pickup using the Apple online store website. Either way, the end result should hopefully be the same, which should also hopefully stop those interested in the AirPods from constantly calling up their local Apple Store, or constantly looking on the website to see when the in-store collection or online delivery dates improve. For those who are serious about AirPods ownership, the said web service also offers a “priority” alert option. With priority alerts, you can contribute to the running of the service and in return get alerted to stock availability of AirPods before anyone else for higher chances of grabbing one before they run out of stock again. 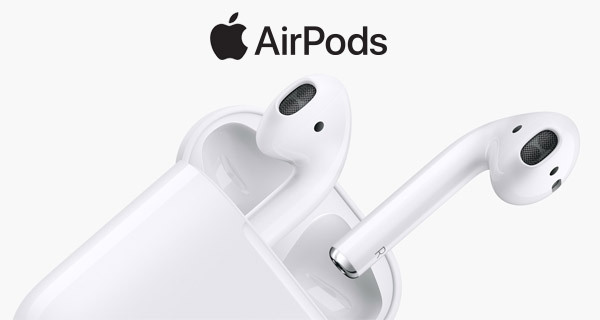 The aforementioned web service for AirPods stock availability can be accessed at: airpods.isinstock.com. Of course this is it free, if you want it bad enough they’ll have you pay to get notified. It’s free. If you want to be put at the top of the list when they send out notifications, you can pay $2.